Main rotor blades flex up and down through the air (called blade flapping) and produce a noise with a chopping sound effect. Helicopters with a two blade rotor system produce a greater chopping sound than multiple rotor blade systems. Bigger blades produce higher noise levels. The tail rotor contributes a high pitching noise (similar to the engine) which can be annoying. Engines produce a constant noise level. Many helicopters have not been designed to be quiet, and on these helicopters no effort has been made to reduce noise levels. The result is a high pitching noise originating from the exhaust pipe. 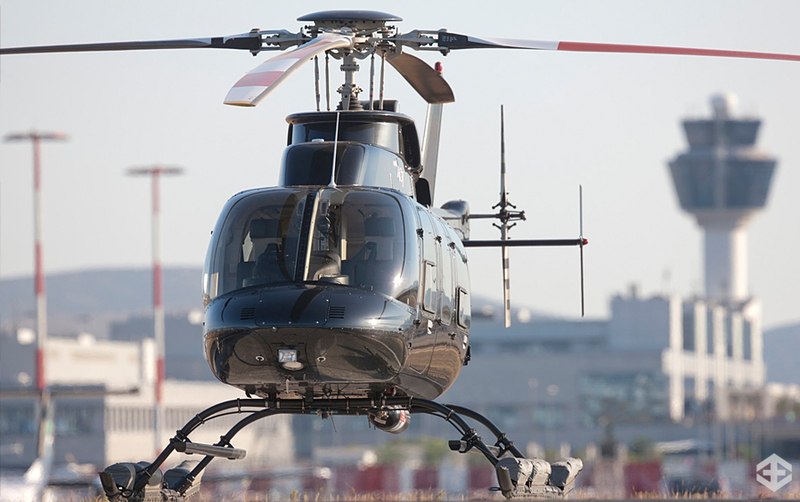 By adding mufflers and changing the position of the exhaust system some modern helicopters have low noise levels from the engine. Noise levels can be greatly reduced by the pilots way of flying". Rapid changes, turns and descents at certain speeds produce short but high noise levels induced by blade flapping. Low flying helicopters produce high noise levels. Generally, modern helicopters flying more than 500 feet above the ground produce acceptable noise levels. Noise levels from helicopters flying directly overhead are more critical than from helicopters passing to the side. However, with some helicopters noise from the engine and from the tail rotor are higher when approaching or departing in certain directions related to the observer on the ground. The helicopters used by East End Helicopter are designed to fly quiet. Blade flapping, tail rotor noise and engine noise are well below noise levels established by the International Civil Aviation Organization. East End Helicopter pilots incorporate noise abatement in their flight planning. Noise sensitive areas, including cities, parks, wilderness areas and sanctuaries will be avoided as much as possible. If safety permits, the pilots will voluntarily maintain 1,000 feet above the ground over these areas. Any landings and takeoffs in or close to noise sensitive areas wilt be performed according to the recommended noise abatement procedures for takeoff and landing for that helicopter, if safety permits. All flights over noise sensitive areas are closely monitored to avoid unnecessary flights and to keep the number of flights to a reasonable level. FAA (Federal Aviation Administration) Regulations The FAA has established no regulations regarding the noise of helicopters. East End Helicopter will voluntarity follow the noise abatement procedures prescribed above and comply with the fly neighborly program established by Helicopter Association International. The FAA has established no regulations for minimum altitudes over any areas around New York. The FAA is the only agency that controls the regulations of airspace therefore any other agency cannot regulate minimum altitude over any areas. However, the FAA recommends minimum altitudes over some areas around New York. East End Helicopter will voluntarily fly the recommended minimum altitudes, if safety permits.